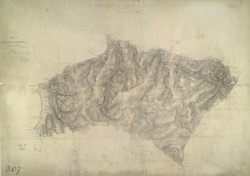 Below the formal title of this plan of Snowdonia, in the top left margin, is an area calculation table in black ink. Brushwork interlining ('hachuring') and colour washes are combined with numerical annotations to describe the relative relief and height of the land. The altitudes recorded in red ink are trigonometrically ascertained: those in black are estimated.